This page presents FPGA projects on fpga4student.com. The first FPGA project helps students understand the basics of FPGAs and how Verilog/ VHDL works on FPGA. Some of the FPGA projects can be FPGA tutorials such as What is FPGA Programming, image processing on FPGA, matrix multiplication on FPGA Xilinx using Core Generator, Verilog vs VHDL: Explain by Examples and how to load text files or images into FPGA. Many others FPGA projects provide students with full Verilog/ VHDL source code to practice and run on FPGA boards. Some of them can be used for another bigger FPGA projects. 1. What is an FPGA? How does FPGA work? 51. What is FPGA Programming? 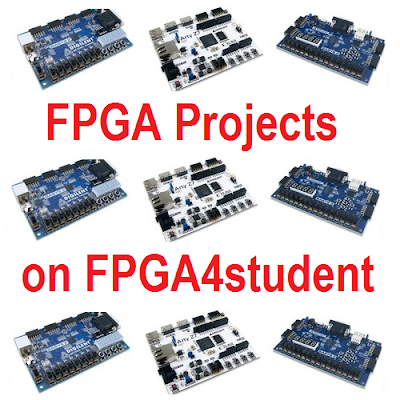 FPGA4student will keep updating upcoming FPGA projects with full Verilog/VHDL source code. Hence, keep you up to date with FPGA projects on fpga4student.com. You can subscribe here to get FPGA projects directly to your inbox. You can also ask for help here if you encounter any difficulty in FPGA projects.